Measuring - Have You Got it Taped? 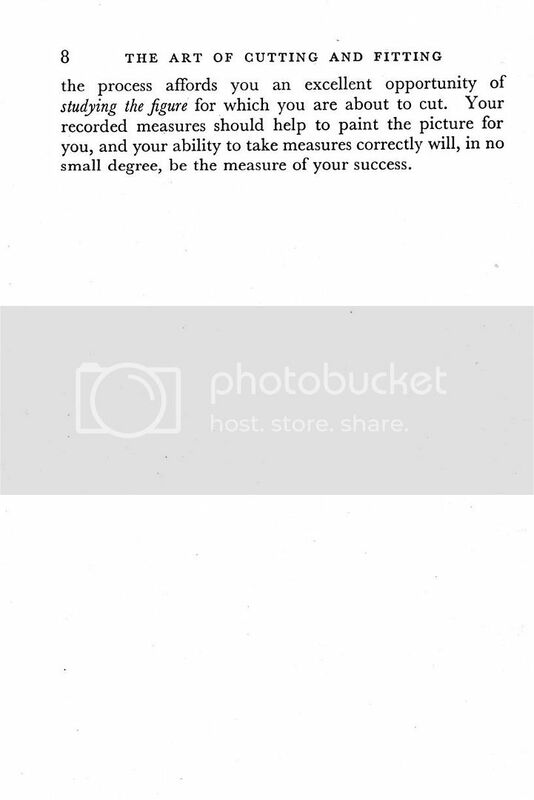 The other parts of the book can be found here. Is it a standard practice to discern length of coat and sleeve from an already made model worn by the subject? "Take the first measures (that is, length of coat, width of back and sleeve length) with the coat on. If this is the case, would a tailoring house have a set of "pre-sized" jackets to make such judgments? If this is the case, would a tailoring house have a set of "pre-sized" jackets to make such judgements? 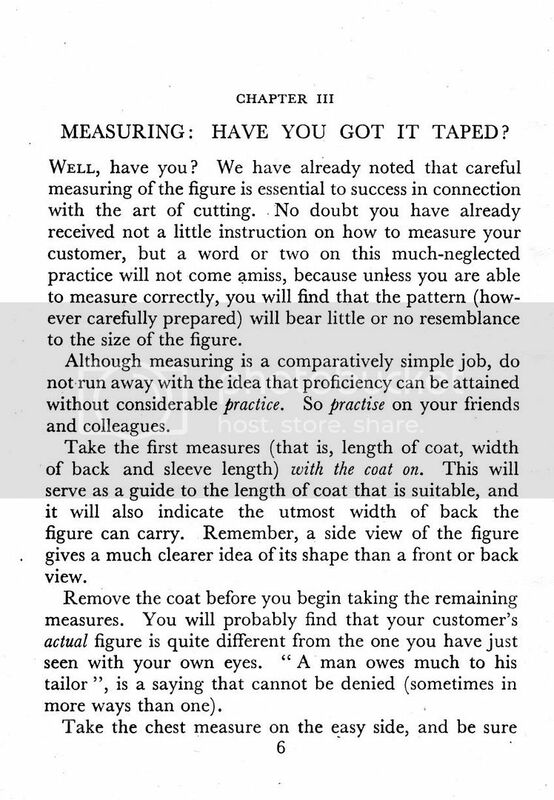 It's a common practice often mentioned in older cutting manuals, but they add that it must be a well fitting garment of which the measures are taken. It's a good starting point, but does not always provide proper measures. Some of my older colleagues still do that, but not with a really good result, which is mostly because of the poor fit of the RTW coats they use as a sample. "pre-sized" jackets are mostly used by MTM companies, which is not that bad, if the person doing the selling and "fitting" actually knows what he/ she is doing. I doubt that renown tailoring firms will make you wear one of their RTW coats (should they offer some). It's actually a good training to watch other people in their clothes and try to spot the defects in the garment caused by the figure of the wearer. A good guide is, sleeve length measured to the break of the wrist, jacket length to the base of the buttocks. ... in the absence of design requirements or customer's specification that it be otherwise. RTW and MTM sleeves come in two stock lengths because we operate on the assumption that you will be receiving a fitting at the retailer's location. ... and now, in imitation to bespoke, RTW includes "working buttonholes" on sleeves, which makes alteration so more difficult (when the alteration tailors knows how to do it, I've seen too often sleeve cut at the wrist with buttons just at the border). BTW, does anybody have an idea why designers make so long sleeves these days ? All the MTM sellers I know have sleeve at custom length, though. If the coat is unreliable then measure over the shirt or vest from the nape for the different length measures. Armhole depth on an rtw coat will give you a measurement that is way way to low. 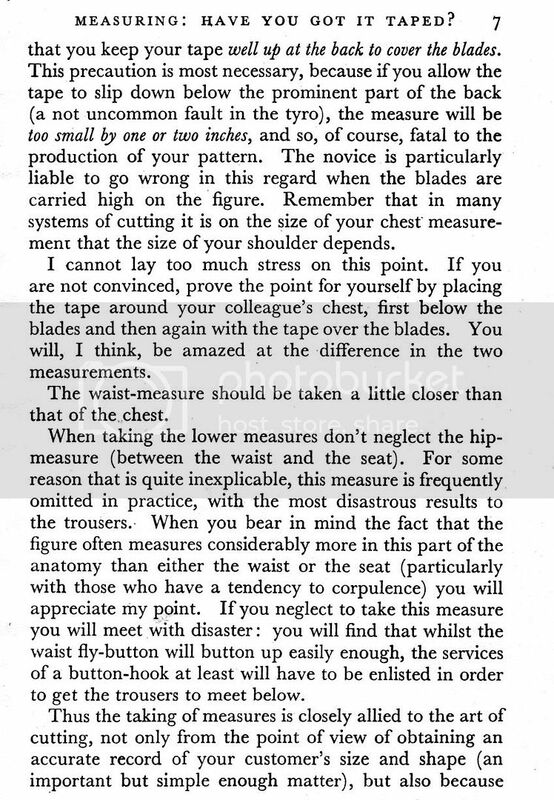 Waist measurement is something like 1/4 height of the person, perhaps in general. Half back is a good measure and continue to elbow and then wrist bone. Working buttonholes are a pain and don't really make sense in a RTW garment. You have to remove the sleeve and shorten it at the top, and that is a lot of work = time and therefore costly. No wonder so many of those sleeves are shortened at the hem (not to mention the tricky process of getting the corrected sleeve back in, plus matching a check etc.). regarding to measuring for a Jacket, we are trying to fit the body, not another jacket, we are making a garment to fit the person , not another coat. Sorry if I am direct. The Tailor / Cutter must understand anatomy and his subject. The starting point to measuring the jacket is the nape of the neck, from here we start. 1) the jacket or coat length, this depends to the fashion request of the day, but as a standard guide the C/B length is from the nape of the neck to the point in line with the inside of the hand when closed. (fingers turned up as to hold the bottom of the garment) For a Coat you drop a minimum of 20cm to just above the knee and as far as the ancels depending on the fashion trends of the day. 2) Sleeve length, the subject is standing with arm held at chest height and bent just over the 90 degree toward the center of the body, this angle gives greater distance for measuring. The measurement is from the spine to the point at the 1/2 back level with the shoulder point position, proceding to the elbow and finally to the wrist, keeping note of each measurement. I must add to this, that this measure will alow the shirt cuff to slightly show, 1.5 to 2 cm , again this is a fashion statement,some years the jacket is shorter showing more and times like now it is a little longer and the cuff does not show, in this case you will need to measure pased the wrist bone to the begining of hand point. WHY EVERYTHING IS LONGER OR BIGGER NOW DAYS, no one is following the standards, and the standards books that you may find are normally out dated, young people in the industry do not know what rule to follow, they have not been tought, proportions are not respected, and this is why we have this problem. Thanks for the opportunity to comment, I hope I have been able to help ?